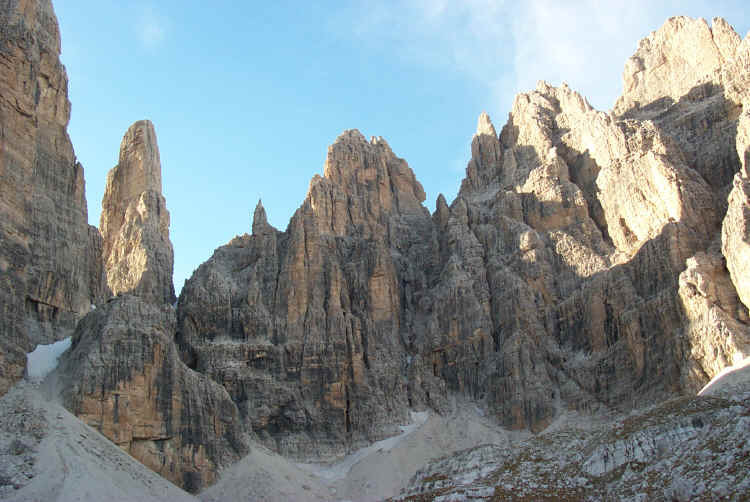 Tour of Monte Daino and Sfulmini chain, Brenta Dolomites, Trentino. 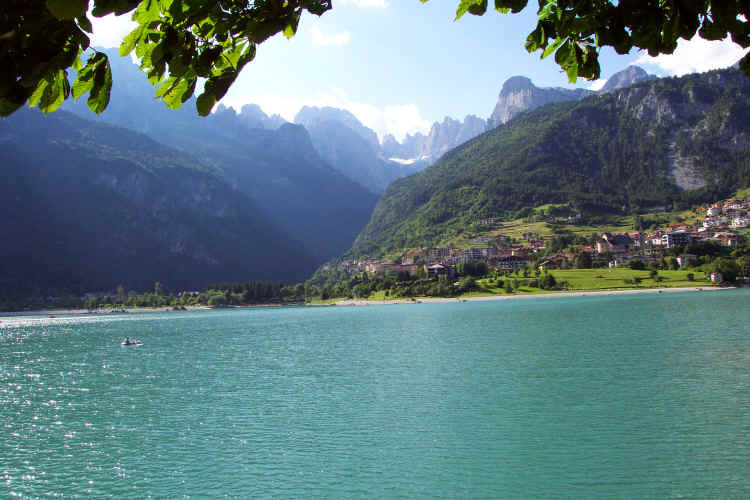 This itinerary starts from and finishes in Molveno; obviously if you change the order of the stages you can also start from Madonna di Campiglio. 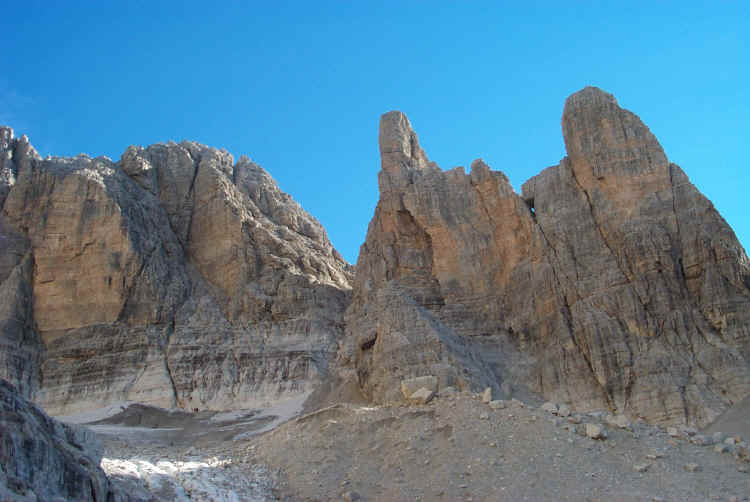 The route goes straightaway into the heart of the Brenta Group and all the various stages stay at a high altitude very close to the most famous peaks. 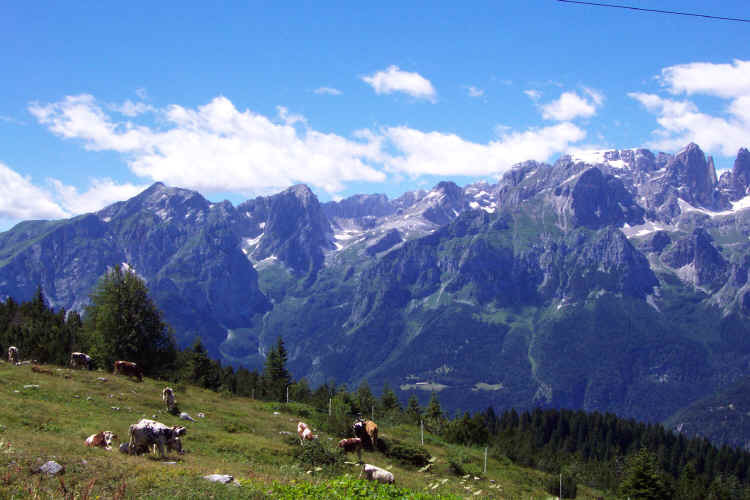 The route also takes in the best-known valleys in the whole of the Brenta Group: Seghe Valley, Massodi Valley, upper Perse Valley, Vallesinella Valley, Brenta Valley and Ceda Valley. This hike does however present a level of difficulty which makes it advisable only for those people who have previous experience with and suitable equipment for the snow-covered paths and the hanging glaciers. 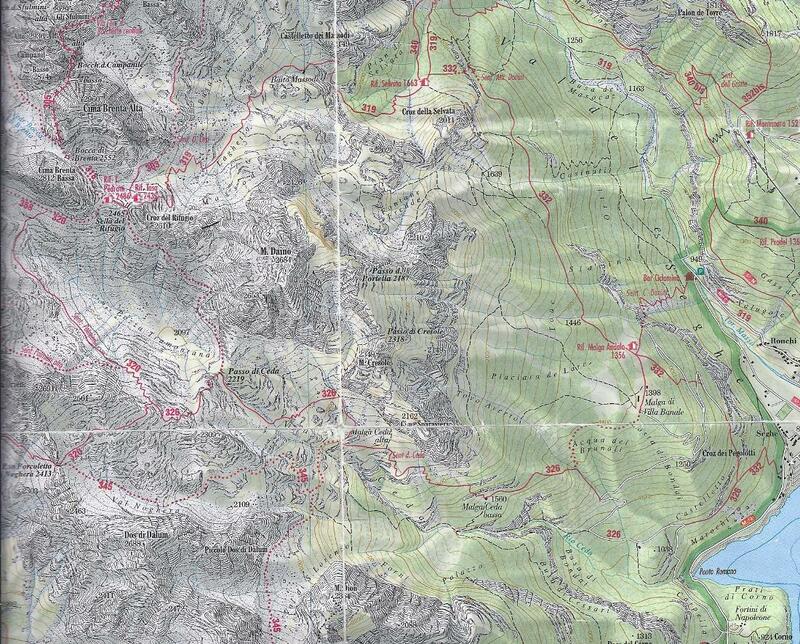 The route takes five days and the hardest stretches, aside from the Orsi path, no. 303, are the mountaineering path, no. 327, named after Daniele Martinazzi, which goes from the Brentei Refuge up the Vedretta dei Camosci hanging glacier, and the descent from the Bocca di Ambiez which, when it is icy, is quite difficult and requires suitable equipment. 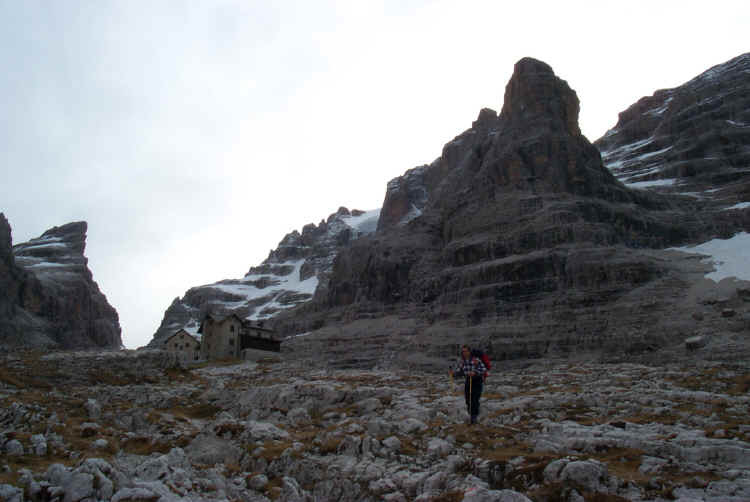 From the Brentei Refuge a quick visit to the Alimonta Refuge is recommended – it can be an alternative bivouac point for the third stage. NB. : the times between points given in the tables refer to an average walking speed (about 300-350 metres of difference in height per hour going uphill, about 500 metres going downhill and about 3 km on the flat), they do not include stops and they assume normal weather conditions. 4th day: Rifugio Brentei- Rifugio Agostini via the Martinazzi Path and Bocca Ambiez. 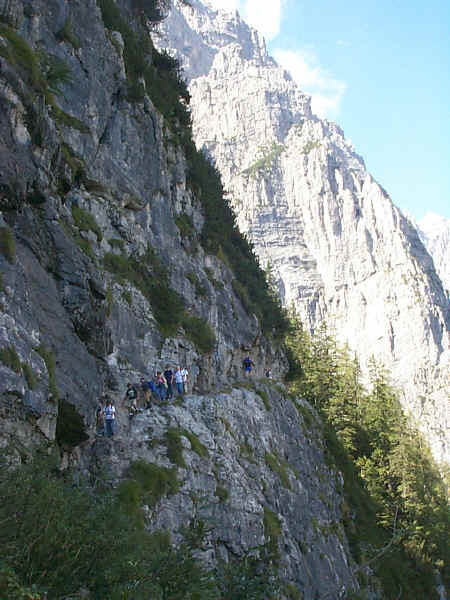 Descrizione: Alternative route in the early stretch to that of the Seghe Valley, a short stretch with fixed rope supports between the Malga Andalo and Selvata Refuges. Comment: Suitable for those who do not wish to tackle the difficulties of the Bocchette route or routes with fixed rope supports. 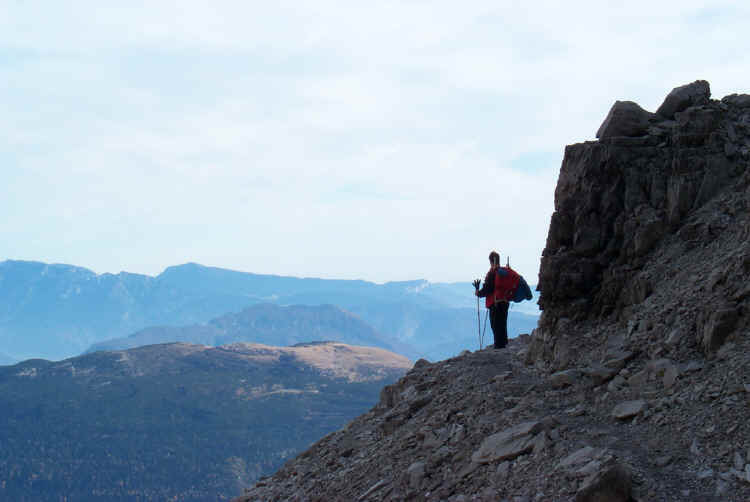 The only stretch with fixed rope supports is along the rock ledge between the Busan dei Armi hollow and the slopes of the Cima Brenta Alta peak. 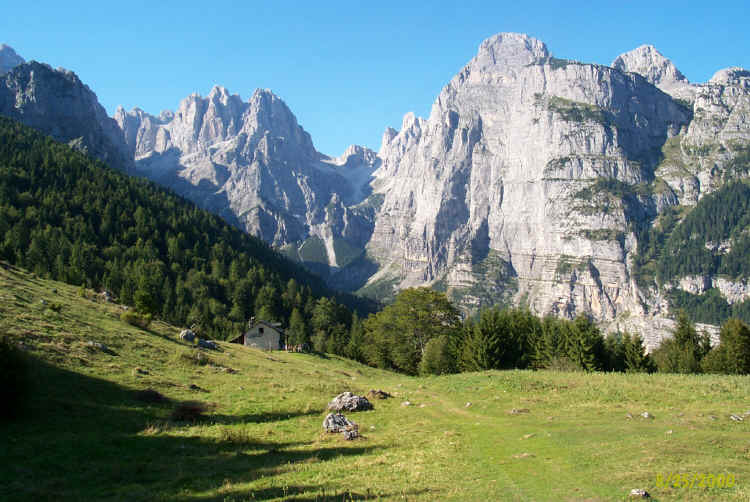 The Orsi path runs parallel but lower down to the Bocchette path and offers unforgettable views over the Sfulmini Group. Commento: The direct link between the Agostini Refuge and the Brentei Refuge runs through scenery that is both some of the wildest and loveliest in the whole of the Brenta Group. 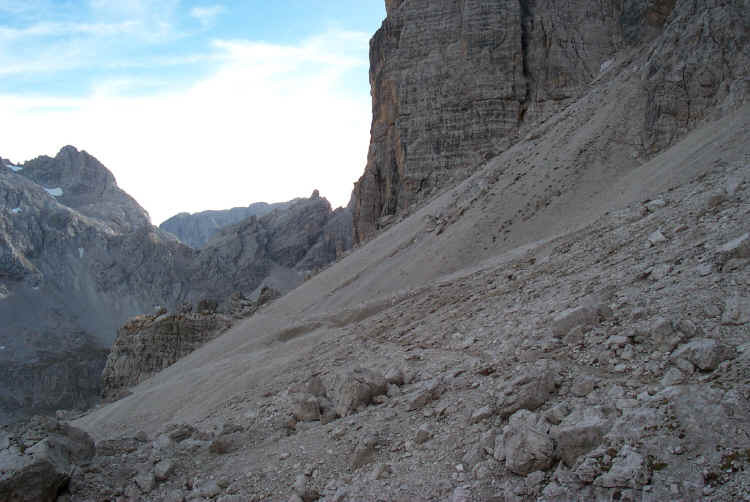 The Martinazzi path climbs up the Vedretta dei Camosci hanging glacier, after going round the Cima Tosa peak from the west and the great Crozzon di Brenta rock face. 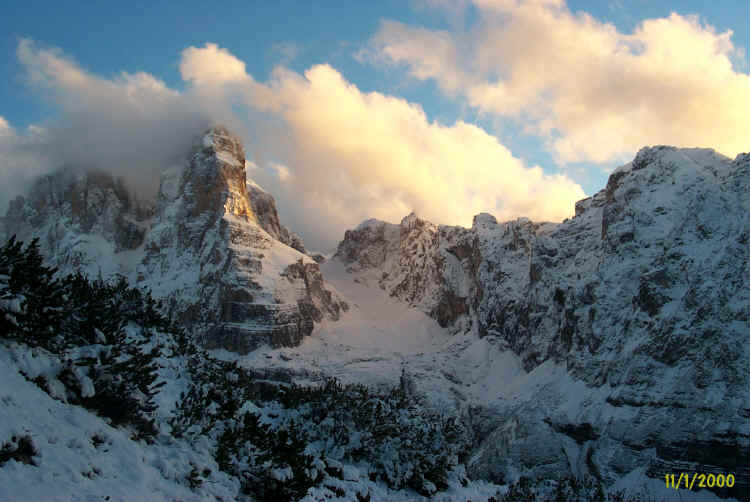 To the west of the path rise the Fracigli peaks and the Crozzon di Val d’Agola. 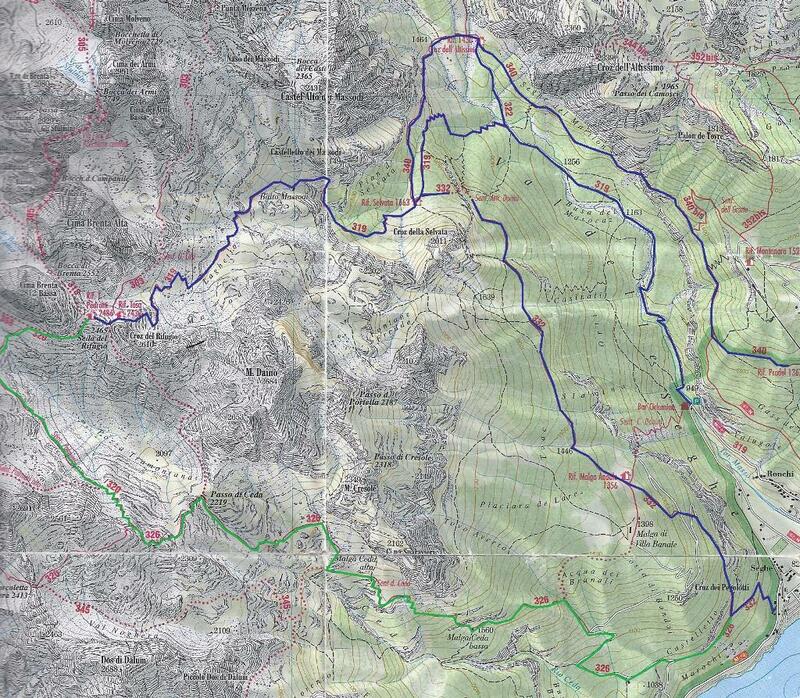 This is a mountain climbing route which is very difficult in parts, especially when the weather is changeable. 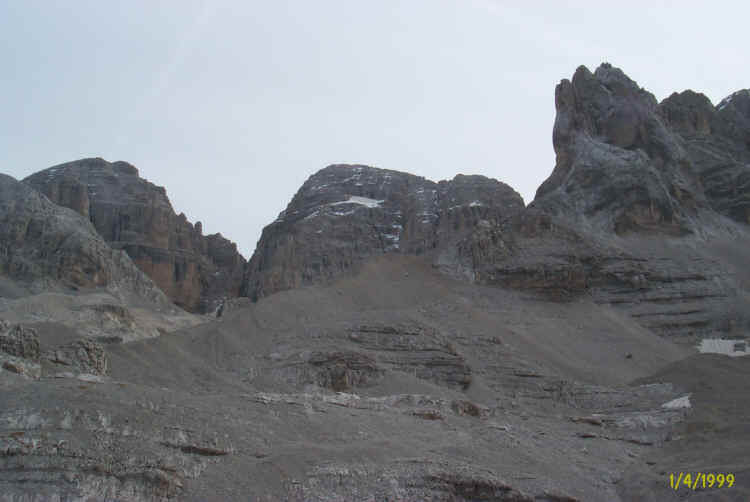 The Vedretta dei Camosci hanging glacier crossing can be difficult because of the crevasses. 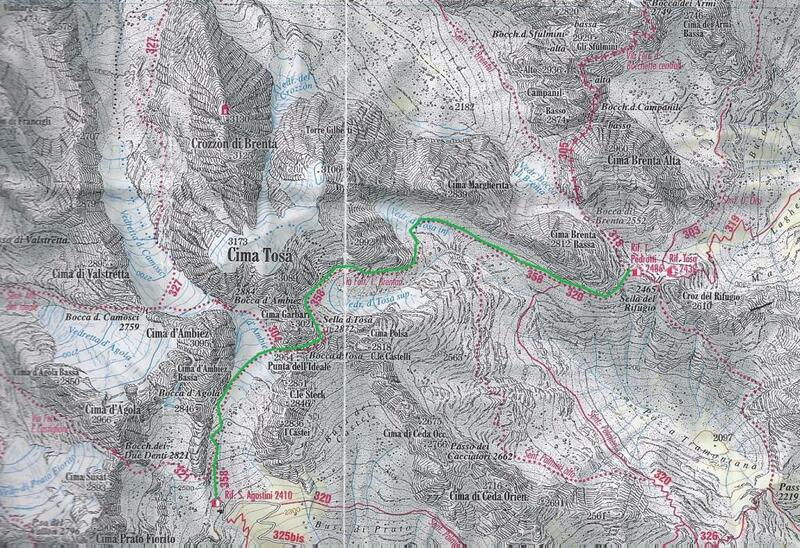 Comment: An unusual route which offers both the wild scenery of the Ceda Valley and wonderful views of Lake Molveno. 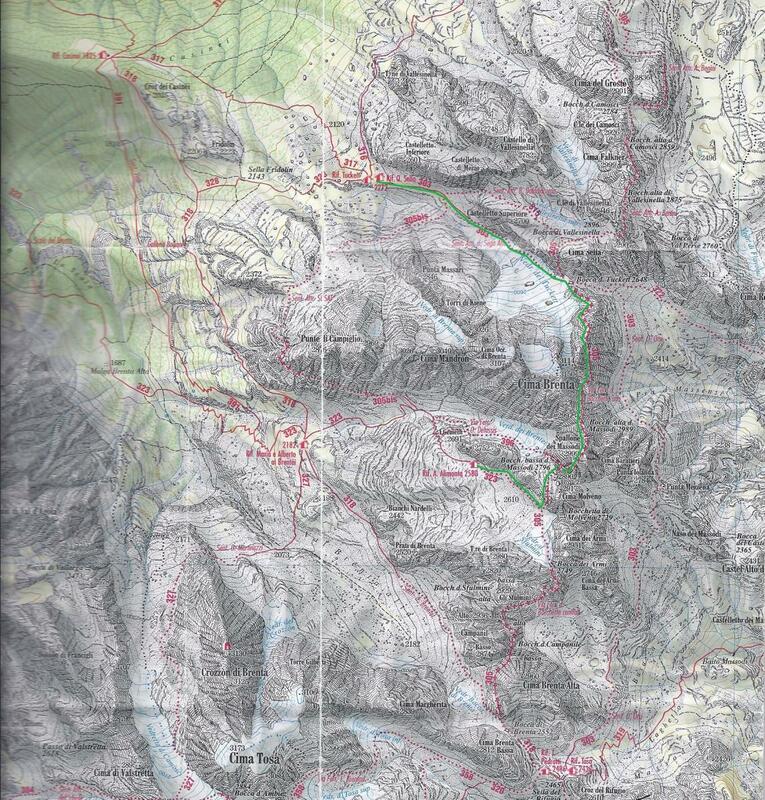 Of interest to those who, from the Agostini Refuge, wish to get to the Malga Spora, Campa Group and north-eastern sector of the Brenta Dolomites along alternative routes.